The Nuclear Regulatory Commission plans a special inspection at Energy Northwest's nuclear power plant near Richland over several anomalies that occurred during the recent refueling outage. "None of these events by themselves had any safety significance or risk," said Greg Cullen, assistant chief nuclear officer at the Columbia Generating Station. But the NRC expects reactor staff to always know what is going on everywhere in the plant, he said. Until the inspection team arrives Monday, Energy Northwest will not know specifically what its concerns are. But it anticipates it will want to talk about five events that occurred while the plant was shut down from early April until this month for scheduled refueling and replacement of its condenser. The NRC declined comment. Its policy is not to announce or discuss special inspections before they begin, but Energy Northwest has discussed the anticipated inspection with its board members. A special inspection is ordered as the lowest level of three types of inspections that the NRC may conduct for operational events. Three of the incidents were linked to loss of some of the water covering the fuel in the reactor, which Energy Northwest believes may be the special inspection's main focus. As a third of the fuel assemblies are replaced during refueling outages every other year, additional water is added to keep the used fuel under water, which provides radioactive shielding, as it is being removed. As water was being added to the reactor core in April, two valves off the main steam line were not closed. The pipeline for generated steam within the core is normally above water. Water that escaped through the valves was collected in a sump within the containment area. Energy Northwest placed the cause on inadequate procedures, which did not clearly specify when the valves were to be closed as water was added. In July when the water level was being dropped in the core, the same valves were opened too soon and more water was collected in the sump. However, the problem was more complicated. Miscommunication between the operations and maintenance staff led operators to believe an opening remained above the core to act as a vent. Because air was not coming in as expected, a vacuum was created and caused instruments to misread water levels. Based on the readings, operators mistakenly believed the water level was below the main steam vent when the valves were opened. About 4,000 gallons of water drained in both incidents, Cullen said. Energy Northwest officials are particularly concerned about a third incident this month in which the water level of about 21 feet above the fuel dropped about an inch before an operator error was discovered. An experienced operator used his own knowledge rather than relying on procedural information and missed a procedural step, resulting in the wrong sequence of opening and closing a system of valves, Cullen said. A couple of hundred gallons drained, but did not leave the containment area, Cullen said. Another incident was caused by the failure of a computer card, resulting in the loss of shutdown cooling, Cullen said. The cooling system takes water out of the core and puts cooler water back in. Workers had the system operating about 30 minutes after it shut down. Technical specifications for the plant allow it to be taken out of service for two hours during outages, Cullen said. "It looks to be just a random equipment failure," but it continues to be studied, he said. All of the system's cards since have been replaced. In the last incident, the speed at which control rods could be inserted to quickly shut down a reaction were being tested one at a time. The test showed the control rods were being pushed into place faster than expected. The cause was traced to within the system that drives the rods. Part of the drive system had been misaligned after a previous test of the control rods during the outage. A three-person team is expected from the NRC for the special inspection. July 13 (Reuters) - The U.S. nuclear industry's top cop is to weigh major changes in how it regulates the country's 104 reactors after Japan's Fukushima disaster, a move that will help shape the future of the power source and could lead to significant cost increases. A task force recommended the Nuclear Regulatory Commission look at a fundamental shift in how it plans for catastrophes like the earthquake and tsunami that swamped the Fukushima plant in March, the world's worst nuclear disaster in 25 years. Now it is up to the five-member commission to decide which ideas to accept and how quickly to proceed in an industry where plant retrofits can run into the millions. 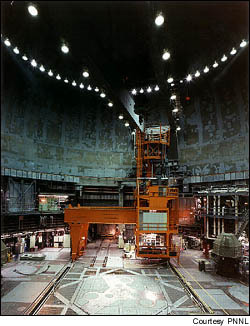 The NRC task force recommended requiring reliable hardened vent designs in boiling water reactors with the General Electric (GE.N) designed Mark I and Mark II containment types, the same as the damaged Fukushima reactors.